Today we hit the jackpot with our first big cucumber picking! Beautiful, fresh cucumbers all over the place! What to do?! 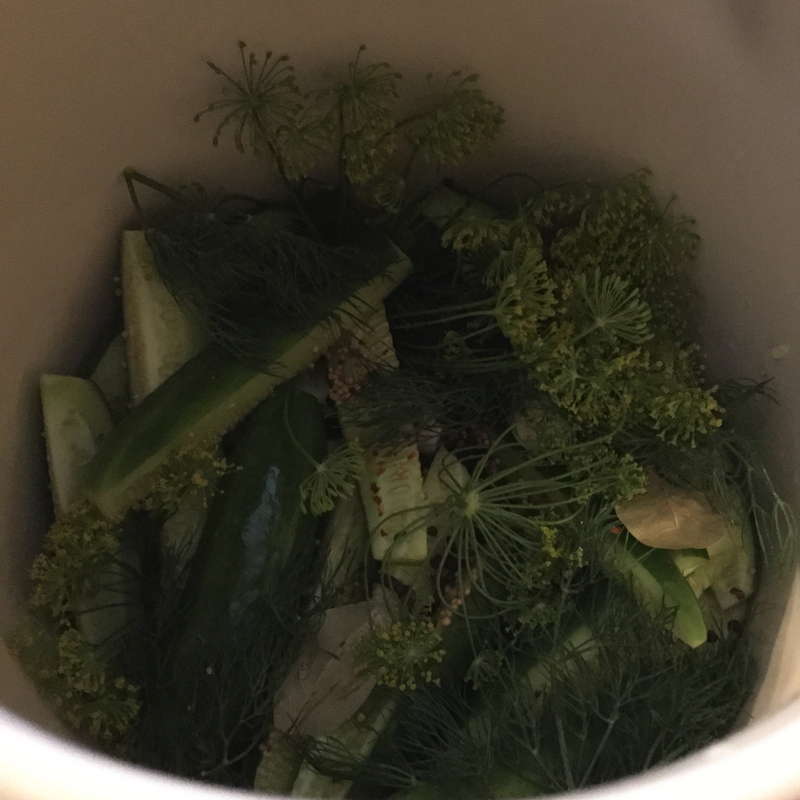 After a lunch of long awaited cucumber, dill, and cream cheese sandwiches, I got to work with processing the rest of the cucumbers while they were still as fresh as can be! 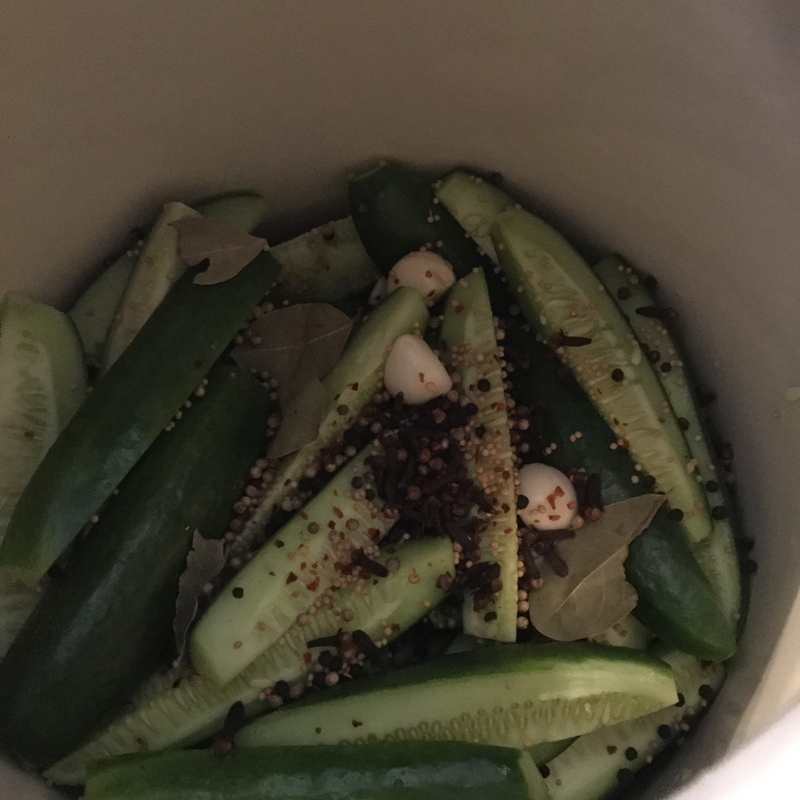 Ever since attending a fermentation class last fall and purchasing our fermenting crock, I’ve been waiting to make lacto-fermented pickles! 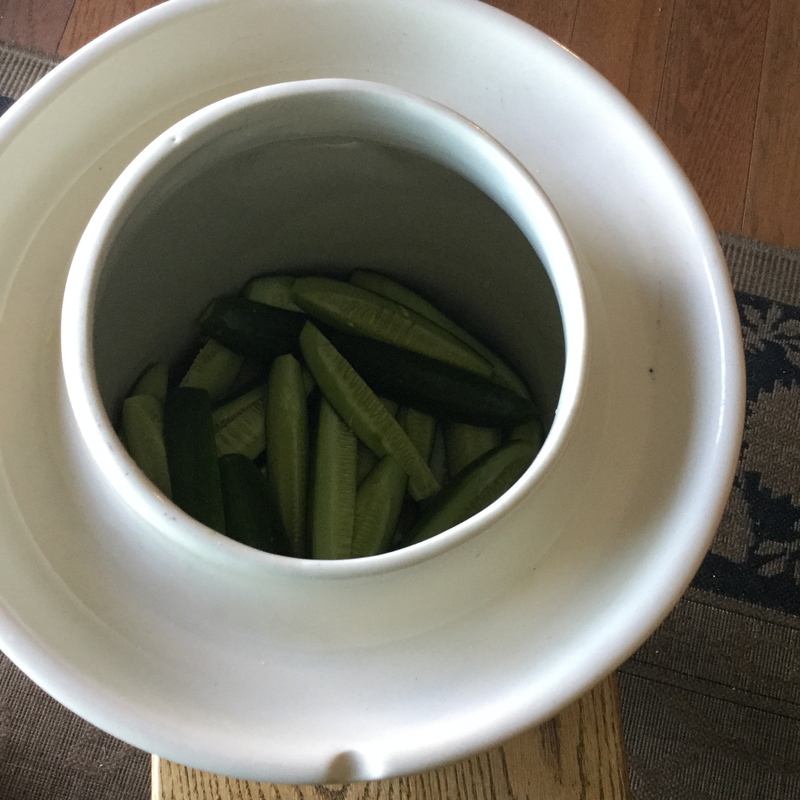 We learned in our class that some farmers used to just keep the crock in the shade of the barn and keep adding clean, fresh vegetables to it all season long! 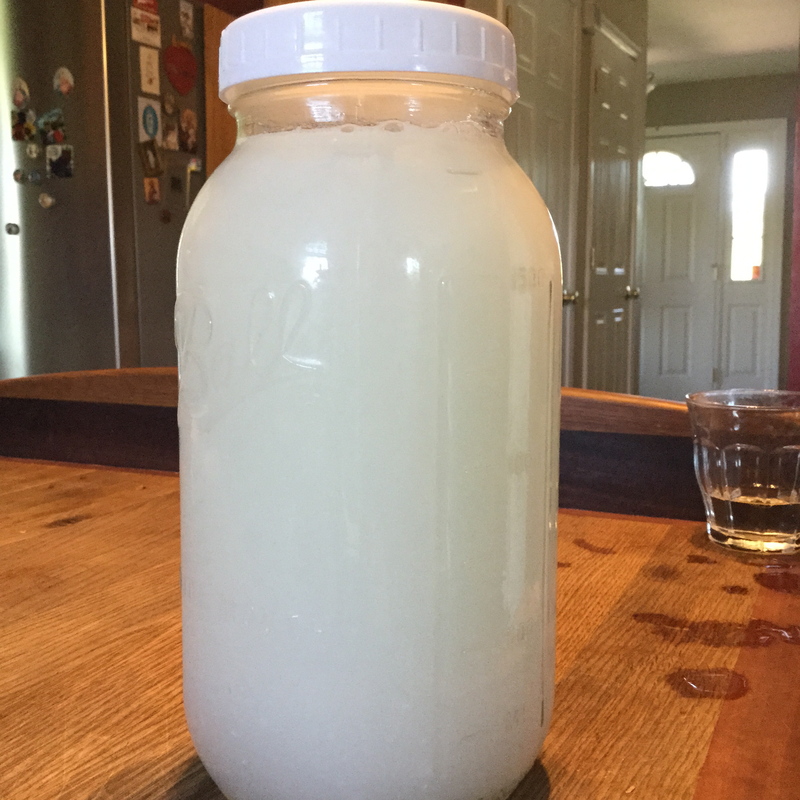 This was so much easier to do than pickling and canning, and the health benefits of lacto-fermented vegetables speak for themselves, so there was nothing to lose! 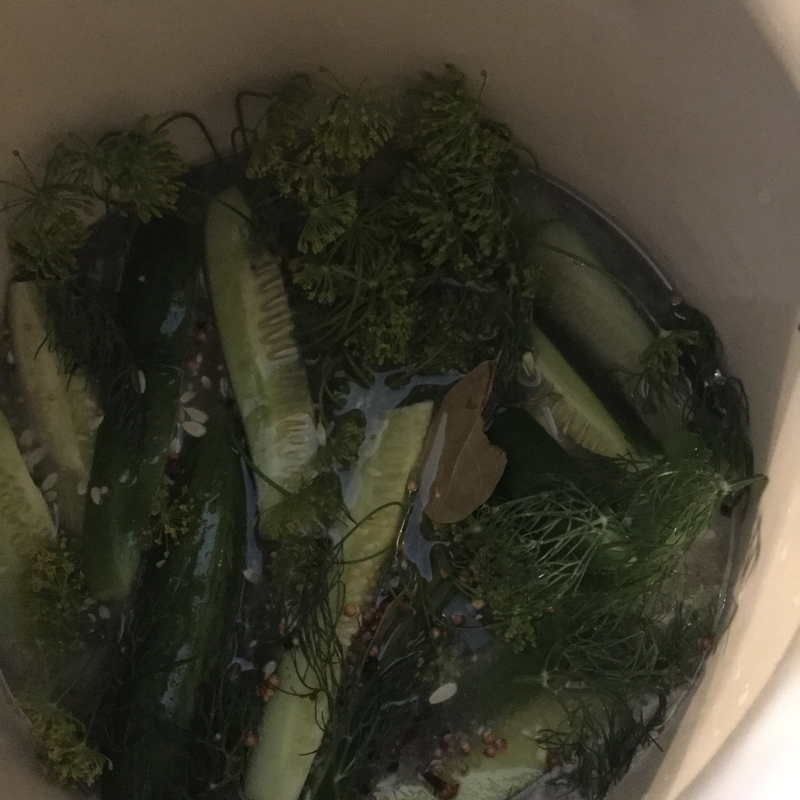 Since our cucumbers were a little large to ferment whole, we first, after washing, cut them into long spears. 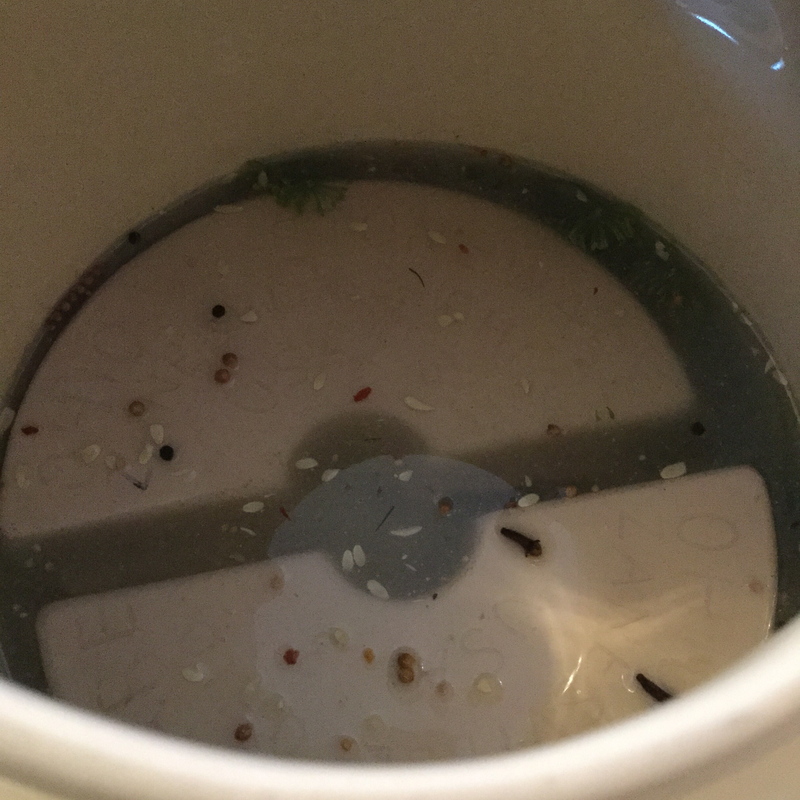 Then it was time to add the garlic and pickling spices…I threw in several whole cloves of our fresh garlic, mustard seeds, coriander, cloves, peppercorns, bay leaves, and crushed red pepper. Already smelling good! 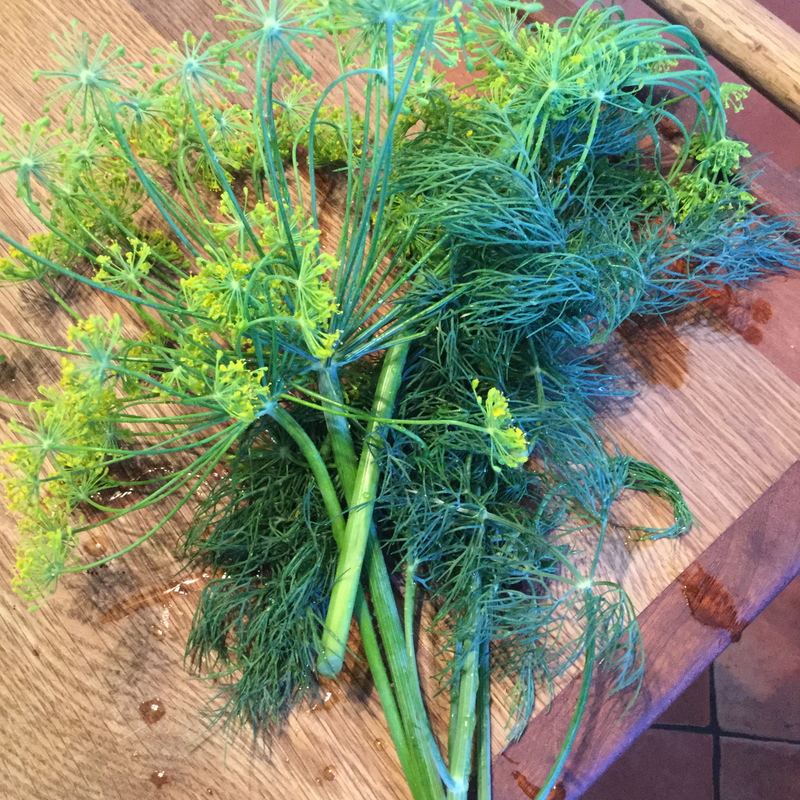 Next I added several springs of freshly picked dill and a few dill flowers: I made a brine with clean well water, sea salt, and some whey that we keep from our homemade yogurt: That was poured over the cucumbers and spices – enough to cover everything when it was pressed down later by the weights. Old timers used to swear by using some grape leaves or horseradish leaves on top to help with crispness of the pickles. 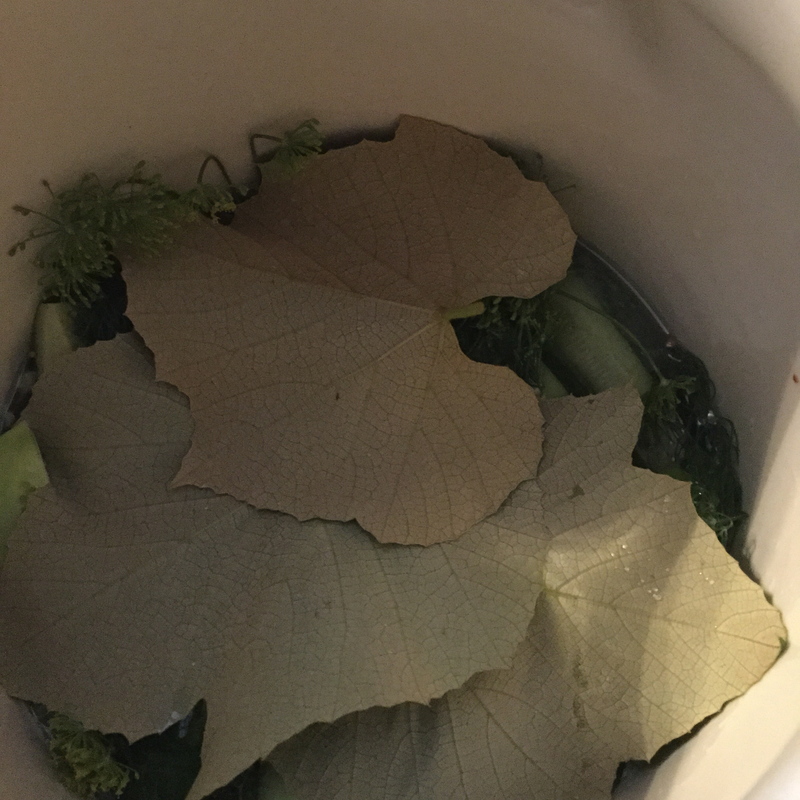 Apparently it should be a leaf with plenty of tannins, and even oak leaves were suggested. One of the recipes I looked at said, “But who would have grape leaves laying around?” Well, after initially thinking, “yeah, right!” I realized that we have Concord grapes growing all over the place here this time of year, as did said “old timers” who were the first fermenters in this area! 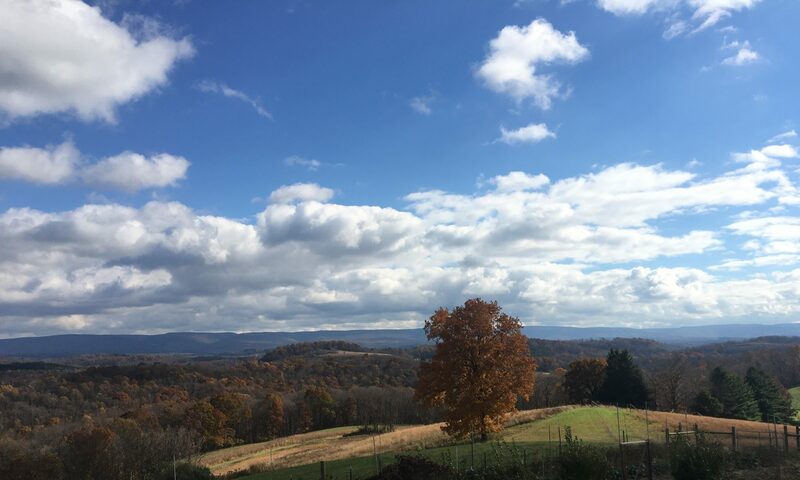 Moments later…gorgeous, big grape leaves! On top of the mix the went: followed by the weights, pressing down firmly to be sure the brine covers all of the cucumbers: And now we wait patiently for the bacteria to do their thing! We hope to have a taste testing in a week or so! Kits and a kitten! THIS doesn’t happen every day around here! Our two does had 7 kits each – and if that wasn’t enough, our youngest daughter scored a new kitten for an early birthday present! With the right background music, this video could go viral, I think! Cuteness abounds this evening!